Last week, thousands of protestors descended upon Pakistan’s capital, Islamabad, led by opposition leader Imran Khan, a former cricket star turned politician. Khan is charging Prime Minister Nawaz Sharif with rigging last year’s election, and he and other opposition figures are demanding Sharif’s resignation. However, a new Pew Research Center survey of Pakistan suggests Sharif can draw on a significant base of public support. Sixty-four percent of Pakistanis have a favorable opinion of the Prime Minister, essentially unchanged from the 66% who expressed this view in a survey conducted weeks before his election victory last year. About a third (32%) give Sharif an unfavorable rating. Khan also receives more positive (53%) than negative (24%) reviews, although his ratings have slipped by 17 percentage points over the past two years. 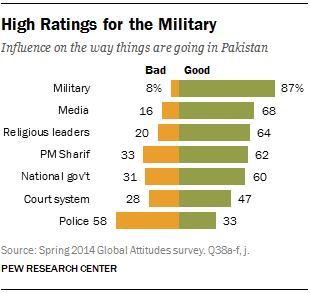 Meanwhile, the country’s military – always a key player in Pakistan’s politics – receives stunningly high ratings. Fully 87% say the military is having a good influence on the nation, up from an already high 79% in 2013. While most Pakistanis remain unhappy with the country’s direction, the public mood is more positive than it has been in recent years. While only 25% are satisfied with the way things are going in Pakistan, this is a significant improvement from the 8% who felt that way in 2013. The percentage saying the economy is in good shape has more than doubled since last year, rising from 17% to 37%. And 36% now expect the economy to improve in the next 12 months. Moreover, while Pakistanis still believe their country faces a long list of challenges, they are now less likely to describe as very big problems issues such as public debt, the situation in Afghanistan, tensions between Sunni and Shia Muslims, and corruption. These are among the major findings from the latest survey in Pakistan by the Pew Research Center, based on face-to-face interviews conducted with 1,203 respondents from April 15 to May 7, 2014. The sample covers approximately 82% of the country’s adult population. (For more details see the Methods section of this report). The poll also finds little support for extremist groups in Pakistan, with only 8% giving the Taliban a positive rating and just 12% saying they having a favorable opinion of al Qaeda. (For more on views about extremism and extremist groups in Pakistan and other predominantly Muslim nations, see this July Pew Research report). Roughly seven-in-ten (71%) express an unfavorable view of India, while only 13% give it a positive rating. At the time of the survey, which was conducted before results for the recent Indian national elections were announced, 62% of Pakistanis did not know enough about India’s new Prime Minister Narendra Modi to say whether they had confidence in his ability to do the right thing in world affairs.1 Just over a third (36%) said they have little or no confidence in Modi to do the right thing in world affairs, while only 1% expressed confidence in Modi. Negative views of the United States still prevail in Pakistan. Only 14% give the U.S. a favorable rating, and just 7% have confidence in President Barack Obama. Still, the percentage of Pakistanis voicing a negative view of the U.S. and Obama has declined slightly over the last few years. Though a majority of people in Pakistan are still unhappy with the country’s direction, satisfaction is on the rise. A quarter of Pakistanis are satisfied with the way things are going in their country, an increase of 17 percentage points from 2013 when just 8% held this view. Pakistanis are more satisfied with the direction of their country than they have been in six years. Men are slightly more likely to express satisfaction (29%) than women (20%). 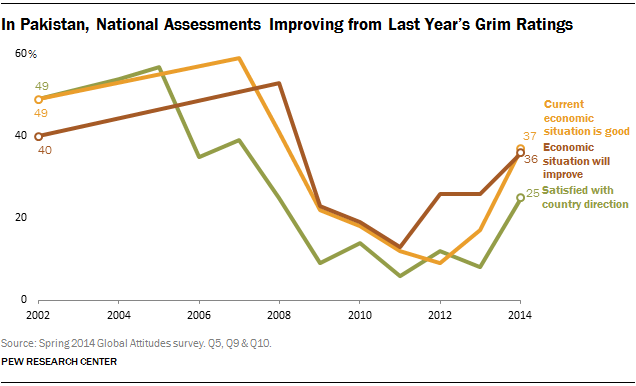 This increasingly positive attitude toward national conditions can also be seen in the public’s improving economic assessments, as the country recovers from the global recession that began in 2008. Thirty-seven percent say the current economic situation is good, up 20 percentage points from last spring. Though 51% still believe the economy is in poor shape, this number has dropped 30 percentage points in only a year. Again, men (45%) are more likely than women (28%) to say that the economy is doing well. Pakistanis are also more optimistic about their country’s economic future than they were a year ago. Today, a 36%-plurality believes the economy will improve over the next 12 months, a 10 point increase since last year. Just 17% think the economy will worsen, down from 60% in 2011, which was the peak of pessimistic attitudes. Less than a quarter (21%) say the economic situation will remain the same. Views about Pakistan’s direction and the state of the economy tend to be more positive among supporters of Prime Minister Nawaz Sharif. For example, 47% of those with a positive opinion of Sharif believe the economy will improve in the next year, compared with 14% of those with an unfavorable view of the Prime Minister. When Pakistanis are asked about the top problems facing their country, rising prices, electricity shortages, a lack of job opportunities, and crime top the list. Nine-in-ten or more name these as very big problems facing their nation. Half or more of Pakistanis rate 11 of the 16 issues included on the survey as very big problems. Though most agree the country faces many serious problems, Pakistanis report less concern than in years past on several issues. The number of people saying that public debt, the situation in Afghanistan and tensions between Sunni and Shia Muslims are very serious problems has declined by 20 percentage points or more in the last year. Significantly fewer people also report concerns about Indian influence in Afghanistan, corrupt political leaders, the quality of schools, inequality and crime. Nawaz Sharif, who took office as prime minister just over one year ago, has maintained his popularity through his first year. More than six-in-ten Pakistanis (64%) say they have a favorable opinion of the prime minister, while 32% view him unfavorably. Sharif’s favorable rating is virtually unchanged from last year when he enjoyed 66% favorability. Support for Sharif is particularly high in Punjab (75%), Pakistan’s most populous province. Imran Khan, leader of the Pakistan Tehreek-e-Insaf party (PTI), receives generally positive ratings. More than half of Pakistanis (53%) have favorable views of the opposition leader and former cricket player, while about a quarter (24%) have a negative opinion of him. Though Khan is generally liked, his support has seen a marked decline since 2012, dropping 17 percentage points in just two years, from a high of 70%. Roughly one-in-five (22%) offer no opinion about Khan, up from 11% two years ago. Former President Asif Ali Zardari, who left office in September 2013 with a favorability rating of 14%, continues to be unpopular, though he has seen a boost to his favorability since stepping down. Roughly a quarter of Pakistanis (27%) now have a positive opinion of Zardari, although 69% still express a negative view. Ratings for General Raheel Sharif, former Chief Justice Iftikhar Muhammad Chaudhry and current President Mamnoon Hussain are more positive than negative, though many decline to offer an opinion. About four-in-ten (41%) have a favorable opinion of General Sharif, the current Chief of Army Staff, while just 12% offer a negative view. Similarly, 40% express a positive opinion of Chaudhry; 19% report a negative view. Support for Chaudhry has seen a slow decline since 2010, when 61% held positive opinions of him. Hussain receives higher favorable than unfavorable views, but a majority of Pakistanis (55%) offer no opinion about their opinions of the businessman-turned-politician. The Pakistani military receives an extremely high level of public support. Fully 87% give the military positive ratings, an eight percentage point increase from 2013. Six-in-ten or more also say the media (68%), religious leaders (64%), Prime Minister Sharif (62%) and the national government (60%) are having a good influence on the way things are going in Pakistan. The national government has seen a surge in support since Zardari left office. In 2013, about a quarter of Pakistanis (24%) gave the government a favorable evaluation. Sharif also enjoys overwhelming public support compared to his predecessor. Just months before leaving office, only 15% of Pakistanis believed Zardari was having a positive influence. Pakistanis broadly support the education of girls. More than eight-in-ten (86%) say that education is equally important for boys and girls. Very few think that education is either more important for boys than girls (7%) or more important for girls than boys (5%). And more people express favorable (30%) than unfavorable (20%) opinions of Malala Yousafzai, the 17-year-old from Pakistan who survived an assassination attempt by the Taliban for her outspoken activism for girls’ education. About half (51%) do not offer an opinion about her. Extremist groups in Pakistan receive very low marks. Twelve percent give al Qaeda a favorable rating, while just 8% hold a positive view of the Taliban. Still, negative ratings for these organizations have declined since 2009, when fighting between the Taliban and the Pakistani military in the Swat Valley generated strong concerns about the threats from extremists. However, one-third or more do not give an opinion about these organizations. When considering the threat these organizations pose, 62% say the Taliban is a serious threat to their country. Pakistanis express less concern over al Qaeda – less than half (42%) consider it a serious threat, on par with attitudes in recent years. Three-quarters of Pakistanis believe that India is a serious threat to their nation. The perceived threat posed by India differs somewhat by region. People living in the regions of Punjab and Khyber Pakhtunkhwa say India is a much greater concern than other Pakistanis. Eight-in-ten or more in Punjab (84%) and Khyber Pakhtunkhwa (80%) think India presents a serious threat to Pakistan. Fewer residents of Sindh (55%) and Baluchistan (35%) believe India is a serious concern. Given the choice of India, the Taliban and al Qaeda, 51% of Pakistanis list India as the primary threat to their nation. Substantially more people rate India as their top worry compared to 2013, when concerns were more evenly divided between India (38%) and the Taliban (33%). Currently, the Taliban ranks as the second highest concern, with 25% listing it as the greatest threat. Just 2% list al Qaeda as the number one threat to their country. When asked how the Pakistani government is doing in the fight against extremist groups, the public is divided between believing the government is making progress (28%) and that things are about the same as in the past (24%). One-in-ten believe that the government is losing the fight against extremism, while 38% express no opinion. Pakistanis continue to voice mostly negative opinions of the U.S. Just 14% have a favorable view of the U.S., essentially unchanged from last year’s 11%. However, the percentage of Pakistanis expressing an unfavorable view has declined over the last two years. Currently, 59% offer a negative rating, down from 72% last year and 80% in 2012. About a quarter of Pakistanis (27%) give no opinion about the U.S., up from 16% last year, and 9% two years ago. Very few Pakistanis give President Barack Obama a positive review. Only 7% say they have confidence that Obama will do the right thing in world affairs. About half (52%) lack confidence in the American leader, unchanged from 2013, but down from a peak of 68% in 2011. Fully 41% offer no opinion about Obama. Drone strikes against extremist organizations, a key element of the Obama administration’s national security policy, are widely unpopular in Pakistan, which has been the target of numerous strikes in recent years. Two-in-three Pakistanis oppose U.S. drone attacks, while just 3% approve and 30% offer no opinion. (As the spring 2014 Pew Research poll shows, drone strikes are unpopular across much of the globe). Two-thirds of Pakistanis believe drone strikes kill too many innocent people, and only 21% think they are necessary to defend the country from extremist groups. Roughly four-in-ten (41%) say the drone strikes are being conducted without the approval of Pakistan’s government. Another major Obama administration policy is more popular among Pakistanis: withdrawing most U.S. troops from neighboring Afghanistan. By a 46%-11% margin, Pakistanis say this is a good thing rather than a bad thing (40% do not have an opinion).